NutriFEEDO® is used as a treatment for emergency malnutrition cases. This paste is energy and protein intensive and bears heavy micronutrient fortification – all in order to alleviate Severe Acute Malnutrition. The product is easy for children to eat because it dispenses readily from a tear-open package. The fortified peanut butter-like paste contains fats, carbohydrates, vitamins and minerals as essential nutrients. What is Severe Acute Malnutrition? Severe Acute Malnutrition is defined by a very low weight for height (below -3 z scores of the median WHO growth standards), by having a a mid-upper arm circumference (MUAC) <115 mm, by visible severe wasting or by the presence of nutritional oedema. Decreasing child mortality and improving maternal health depends heavily on reducing malnutrition which is responsible for major deaths among children under 5 years of age. 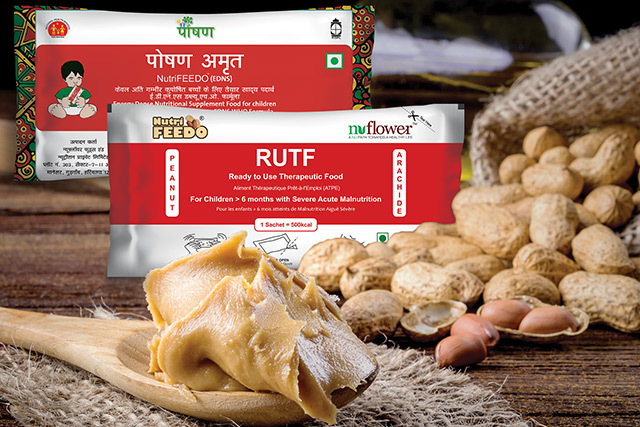 NutriFEEDO® is an energy-intensive peanut based ready-to-use therapeutic paste for children within the age group of 6 months to 59 months. It seeks to provide an intensive energy boost coupled with a substantial micronutrient fortification to the body. And thus, is used by many health practitioners in the treatment of Severe Acute Malnutrition (SAM). Ready-to-Use Therapeutic Food (RUTF) have proven to be effective in the community-based treatment of Severe Acute Malnutrition (SAM) because of their specialized nutrient composition, the reduced risk of contamination associated with their use, and the fact that children can consume RUTF in their homes, obviating the need for inpatient treatment. The packet needs to be kneaded, opened and eaten. Dosage for NutriFEEDO® in children with Severe Acute Malnutrition depends on the weight, height and age of the child. An approximate measure would be around 200 calories per kilogram of weight (200kcal/kg/day). The exact doses to be given to SAM children would be decided as per the recommended amounts of ready to use therapeutic food for a given child’s weight. Saket District Centre, Saket, New Delhi-110017, India.